This Prayer Book is quite different from other Anglican Books of Common Prayer (BCP's). For one, it basically contains only of the Daily Office and the Psalter - other services, including the Eucharist, Burial, Baptism, Marriage, etc., are missing. And, more significantly, it seems to owe little to earlier BCP's of the Church of England. This Book originated in 1919 with Bp. 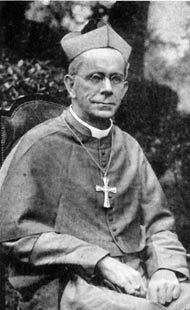 Frank Weston, then Bishop of Zanzibar. In keeping with Bp. Weston's orientation, it is very strongly Anglo-Catholic. For example, the "Hail Mary" is an intergral part of a number of the services, and the Calendar includes, for example, the Immaculate Conception, Corpus Christi, the Most Precious Blood of Jesus, the Assumption of Mary, and a number of post-Reformation Roman Catholics. This book appears to have been used on the islands of Zanzibar, plus coastal and southern Tanganyika (all part of modern-day Tanzania). This particular part of Africa was evangelized by UMCA (Universities' Mission to Central Africa) missionaries - who tended to be "high church" or Anglo-Catholic, in contrast to other parts of East Africa, which were evangelized by CMS (Church Missionary Society) missionaries, who tended to be "low-church" or Evangelical. These differences persist in the Anglican dioceses of Africa to this day. It is not known if this Prayer Book is still in use, but it was used at least after 1961, when Tanganyika gained independence. It is in the Zanzibar, or Southern, or Kiunjuga dialect of Swahili (one of the two main dialects), and appears in David Griffiths' Bibliography of the Book of Common Prayer as 166:5. Griffiths does not list any companion volume containing other services normally part of the BCP, but an outline in English of the Eucharist service (including a translation of the Canon) appears in Bernard Wigan's The Liturgy in English. This service is also very strongly Anglo-Catholic. The Zanzibar BCP presented here was only published in Swahili; no English version was ever made. Besides the HTML pages linked to below, we also have the entire book available as PDF graphics. There is text "behind" the graphics, but this has not been proofread and undoubtedly contains errors. I do not know any Swahili, so the translations given here were done solely with the aid of a Swahili-English dictionary. I would be grateful to receive any clarifications or corrections. Kitabu hiki kilikubaliwa na marehemu Bwana Askofu Frank Weston na Makasisi wake mwezi wa Septemba, 1917. Aliitoa idhini yake kipigwe chapa katika Mkutano mkuu wa Makasisi, waliokutanika katika Kanisa la Hegongo, Muheza, 22 Januari, 1918. Basi, tokea siku ile, hiki ndicho Kitabu cha Sala kilichoamriwa kusomwa katika makanisa yetu yote. Hakuna ruhusa kusoma vinginevyo, wala kuvibadili-badili vilivyoagizwa humu. Aidha, kila Kasisi na Shemasi faradhi yake ni kuzisoma kila siku sala hizi za asubuhi, adhuhuri, jioni, na usiku, na kama vile zilivyopangwa humu. Imepita sasa miaka ishirini na mitano, na kitabu kinahitaji kupigwa chapa upya. Basi tumeona vema kuzidi kuyatengeneza mambo yaliyomo, ili kizidi kutufalia katika Ibada za Kanisa, kwa utukufu wa Mungu. Sasa kitabu hiki kilivyo ndicho chenye idhini yetu.